and savour the magic of authentic Kerala cuisine. is inspired by fresh produce, seasonal ingredients and memories from our grandmother's kitchen. where you will create unforgettable memories savouring our exquisite, authentically-prepared dishes. Some days you miss your mother's cooking and other days you crave for delectable flavours that create new memories. The secret ingredient which makes these dishes special is love and everyone wants that feeling of having had a hearty meal. 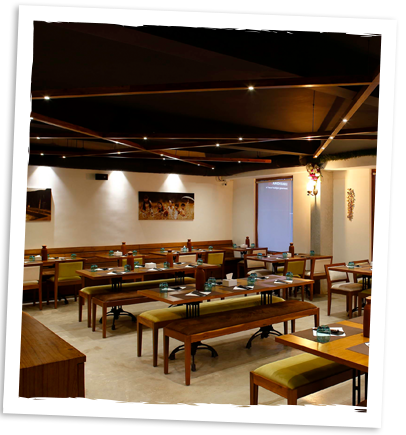 At Kappa Chakka Kandhari, every dish is prepared with a lot of love and fine detail. Malayalis who are living away from home will be transported back home on relishing these dishes. And those who are new to Kerala cuisine will discover a new, unforgettable culinary world. Kappa Chakka Kandhari enriches and challenges your sensory experience through its authentic delicacies from Kerala. Fresh produce, seasonal ingredients and innovative ideas combine to give traditional Kerala cuisine a contemporary experience. Today, Kappa Chakka Kandhari is a renowned name for Kerala cuisine where you can leisurely indulge your palate and relish a feast for the senses. Tellicherry peppercorns: Black gold from the heart of the Malabar coast. These peppercorns are sweet with a balanced flavour and complex aroma making it a great stand-alone pepper. We source the best of these peppercorns directly from the organic farmers of the Malabar region to provide the best sensory experience. The Queen of Spices is cardamom which adds spice to your years and years to your life. The world famous Idukki cardamom is an ingredient found in the finest gourmet food in cuisines across the globe. KCK sources these cardamoms from the rainforests of the Western Ghats in Idukki where it is organically cultivated and preserved for freshness. Cinnamon from Cinnamon Valley of Anjarakandy, Kannur Cinnamon was the rarest and valuable gift for kings and in ancient times. We source cinnamon from the banks Anjarakandi river where the fresh cinnamon has a unique taste, texture and tantalizing aroma. Ginger equals a 100 other spices The mist-capped Wayanad Hills of the Western Ghats and the organic farms in Vythri and Manathavady, bring us flavourful ginger for our dishes. This delicious spice holds a prominent place in all cuisines, in our mother’s kitchen and at KCK too. Fairy Fluid from Heaven: Coconut oil from Irinijalakuda in central Kerala Velichanna or pure coconut oil is intrinsically tied to the life and tastebuds of every Malayali. It is the most preferred oil in every kitchen in Kerala where lip-smacking dishes are created every single day. Alleppey turmeric is known for its bright and distinctive yellow tinge and referred to as the Indian saffron. This is the main ingredient of every kitchen in India, which is finely powdered and preserved to retain its real characteristics. This super healthy spice has its space in all dishes which starts from our 'nadan chammanthi' to more.